Qigong (pronounced “chee gung”) is a wonderful way to enjoy the flow and soothing rhythms of tai chi without having to remember complex sequences. This makes it a perfect way to begin your tai chi experience, or a great complement to your tai chi practice. 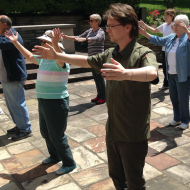 Qigong exercises, often described as moving meditations, focus on body awareness and breathing, in motion and stillness. A fundamental part of Chinese culture fostering health and healing which dates back thousands of years, Qigong is now practiced by millions of people around the world. This class will present a variety of readily accessible Qigong sets to nurture and integrate body, mind and spirit.